This entry and mudroom is extremely functional for this family of four plus one (Molly the dog). The mudroom is large with maximum storage and a personal locker for each member of the family. 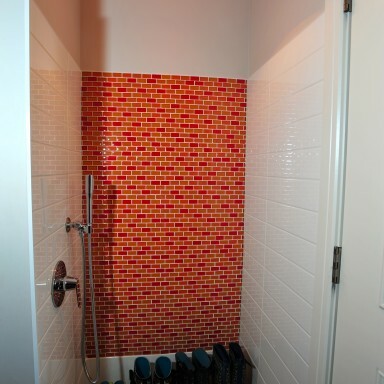 The porcelain tile with in-floor heat is durable and easy to clean. 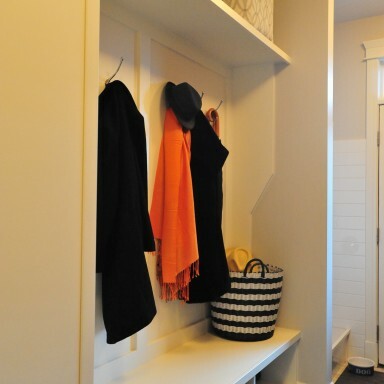 Four lockers provide storage for coats, boots, mitts and scarves. The dog shower is a great place to clean off boots after a day out. Custom open shelving and benches flank this back deck entry door. A locker for each family member houses coats, boots, mitts and scarves, The porcelain floor tile is durable and easy to clean. With the installation of in-floor heat, it is great to step onto when coming in from the winter cold. The color palatte is neutral. This dog shower, located by the back deck door, with clean, white subway tile and a cheerful orange glass back wall is a welcoming and excellent place to rinse off dirty boots after a day out. Molly likes it too.